It is with great sadness that we announce the passing of Theresa Landry of Belledune, wife of the late Leander Landry, who passed away December 20, 2018 at the age of 91. Born in Belledune, she was the daughter of the late Clement and Emilda (Devereaux) Doucet. Theresa will be remembered as a wonderful wife, mother, grandmother, great grandmother, sister and friend who devoted her life to helping others. After returning to Belledune with her husband and young family, she began spending countless hours working in Landry’s General Store and Post Office while taking care of her children. She soon organized catechism classes and acted as coordinator of the religious education programme for the parish for many years. Her other community activities included Belledune home and school, Belledune Days, Belledune Senior Complex, Belledune Girl Guides for 50 years, the Belledune Figure Skating Club where she acted as judge at competitions and Ice Show Chairman. She remains an honorary member to this day. She was a very active member of The Catholic Woman’s League being on the executive council at the parish, diocesan and provincial levels and was awarded the Belllelle Guerin award for her service. She was the first member of Belledune, CWL Council to be awarded the Maple Leaf award for outstanding service to the community. This year, she was awarded her 55-year service pin. She was named Senior Citizen of the Year for the Village of Belledune . In later years, her favorite pastime was knitting sweaters, hats, mittens, etc. For her many grandchildren, great-grandchildren, other family members and friends, prayer shawls for the sick and the elderly and fabricating flowers for Mother’s Day, year after year, to be used as fund raisers for CWL projects. It is an understatement to say that her life can be characterized as a life of service to others. She has had a beneficial influence on the lives of so many young people in the community and she will be forever loved and never forgotten. Theresa is survived by her children Bobby (Sylvia) of Belledune, Che Che Newberry (Nick) of Three Fathom Harbour, NS., Janet Thompson of Erin, ON, Elane Stoughton (Howie) of Lakeland FL., Sue Ann Doucet (Rheal) of Doyleville, Alex (Sandra) of Saskatoon SK., Tammy Giroux (Marc) of Dalhousie; 14 grandchildren; 18 great grandchildren as well as her brother Lawrence and sister Louella.She was predeceased by her husband Leander; son Dana; great grandson Cooper; sisters Margaret Miller and Thelma Robichaud and brothers Marks, James and Nacie. 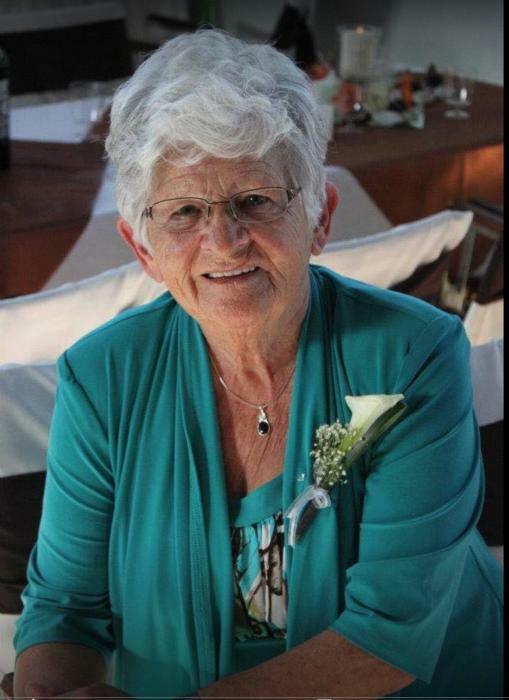 Her funeral service will be held from St. John the Evangelist Church, Belledune, June 26, 2019 at 2 PM. Funeral arrangements are in the care of MacMillan’s Funeral Home, Black Point. There's still time to send flowers to the Funeral Mass at the St. John the Evangelist Church, Belledune at 2:00 PM on June 26, 2019.